Do you manage a cleaning business? Are you looking for opportunities to expand your company’s offerings in Nevada? If the answer is yes, look no further than The BBQ Cleaner. We are currently offering a rapidly growing and attractive BBQ cleaning business opportunity in Nevada that offers stellar rewards. With a low start up cost, you can quickly build a business from scratch. What’s more, it works even if you do not have prior experience to running such a business. At The BBQ Cleaner, we often get many requests for our services in Nevada but what we lack are people like you who can help bring our services to homes in the state. Yes, it’s true! We would like to clarify that are not selling you a franchise and there are no royalties to pay every month or every year. That’s why if you are looking for a business opportunity that allows you to set up flexible service rates and working schedules, with complete help from an established BBQ cleaning company, all you need is work with us at The BBQ Cleaner! Why Start a BBQ Cleaning Business in Nevada? BBQ-friendly Weather Conditions: Nevada is the driest state in the United States, but the average weather conditions can be cool, especially at the start of the year. Many families in Nevada enjoy outdoor BBQs throughout the year. Many Families to Serve: Many Nevada homes own their own grills. You can easily see that there is a large base of potential customers to make money from. Easy to Stand Out from the Crowd: When it comes to BBQ and grill cleaning services in Nevada, it is a non-competitive niche that you can thrive in. Scalable Business Concept: Growing your BBQ grill cleaning service into a successful company in Nevada does not entail a complex process. You will receive all the tools, training, support, and supplies you need to achieve your goals. How Does The BBQ Cleaner Help You Get Started in Nevada? 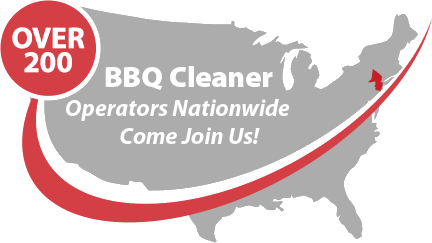 At The BBQ Cleaner, we are a global leader in the BBQ and grill cleaning industry. Our company is established in 1994 and has built a network of more than 180 operators nationwide to date. When you work with us, you have the advantage of gaining access to on-going lifetime business support so that you can unlock unlimited earning potential for your business and company. We are also a one-stop shop for all your cleaning supplies so you never have to look elsewhere. Talk to us today to find out more about this stellar BBQ cleaning business opportunity in Nevada!